Turkey and Black Forest Ham with swiss and american cheese on a french roll with everything on it. 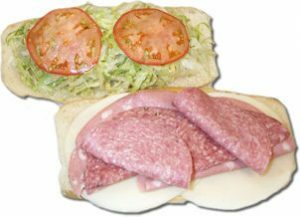 Genoa, Mortadella & Cappicola salamis with provolone cheese. Vinegar & oil dresses the bread. Lettuce, tomato, onions and pepperoncinis. Avocado, swiss and american cheese, sprouts and cucumbers, on whole wheat bread with everything on it. A generous amount of swiss, american and provolone cheese on a french roll with everything on it. Or choose your favorite three cheeses. Hot and toasted in the authentic style with corned beef, sauerkraut, swiss cheese on toasted rye bread, thousand island dressing and mustard. Hot Pastrami, melted swiss cheese, sauerkraut, on toasted rye bread, thousand island dressing and mustard. A mesquite chicken breast with crispy bacon and Tillamook cheddar cheese on a french roll with everything on it including honey dijon mustard. Hot roast beef, crispy bacon and melted blue marbled jack cheese on a toasted french roll. With mayo, lettuce, tomato and vinegar and oil. Hot roast beef, crispy bacon, melted cheddar on taosted rye. With lettuce, tomatoes, onions, mayo, horseradish and ranch. Avocado, Turkey & Cheese (provolone, to be exact). On your choice of bread with everything on it. Turkey, avocado, bacon and provolone cheese on a french roll with everything on it. 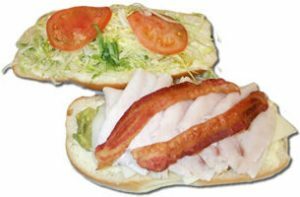 Hot breaded chicken breast, melted swiss cheese, crispy bacon on a toasted onion roll with lettuce, tomato, onion, mayo and vinegar & oil. A triple-decker sandwich with turkey, crispy bacon and your choice of bread with everything on it. A chicken breast with avocado and aged parmesan cheese on a french roll with mayo, lettuce, tomatoes and onions then covered with caesar dressing. Thin sliced turkey with crispy bacon on sourdough bread with dijon mustard and everything on it. Bacon, Lettuce, Tomato with hot thin sliced turkey, cheddar cheese and mayo on sourdough. Black Forest Ham and Italian Salami on a french roll with an olive tapinade tomatoes and onions.Covered with Muenster Cheese and popped into the oven and toasted to perfection. Comes with mustard and mayo. Thin sliced turkey, crispy bacon and muenster cheese on whole wheat bread. Comes with everything on it including honey dijon mustard. Black forest ham, wine cured salami, blue marbled jack on sourdough with everything on it. Our chicken parm sandwich with spicy marinara on a toasted french roll, Comes with mayo, tomatoes and onions. Roast Beef on a french roll with provolone cheese, artichoke hearts mayo, tomatoes and onions. A toasted french roll is covered with hot thin sliced roast beef , sauteed onions, provolone cheese mustard and mayo. Thin sliced Black Forest Ham on sourdough bread with swiss cheese, dijon mustard and everything on it. Hot Pastrami on a toasted french roll with melted swiss cheese, dijon mustard and everything on it. Our famous chicken salad with italian dry salami & provolone cheese on a french roll covered with italian dressing. Lettuce, tomato and onions. Ask for an extra napkin. Hot breaded chicken breast, melted swiss cheese, heated ham, covered with italian spiced bread crumbs on a toasted onion roll with lettuce, tomato, onion, mayo and vinegar & oil. Hot breaded chicken breast with melted cheddar cheese inside a warm wrap. Served with letuce, tomato, onion, mayo and vinegar & oil. Hot breaded chicken breast covered with Frank’s Buffalo Wing Sauce, provolone cheese and then Bleu Cheese Dressing. Served on a toasted french roll with everything on it. Thin sliced roast beef, muenster cheese and jalapenos melted on a french roll with tomatoes, onions, mayo and french dressing. Real deli pepperoni, oven roasted turkey, asiago cheese all melted on a french roll. With mayo tomatoes and onions. Includes: lettuce, tomato, onion, mustard, mayo, vinegar & oil. Ask for dijon or honey dijon mustard. Or ask for pepperoncinis if you like to be difficult.